Are you already feeling the magic of Christmas? The freezing air, the foggy nights, the cosy smell from the fireplaces… Oh, and the beautiful Christmas markets! Germany, France and Austria have been the references in Europe for this tradition for many, many years now. And Luxembourg is the perfect starting point for visiting as many as you want! CLEW has some insider tips to share in this guide to your family Christmas outings. From 23rd November to 12th January, Luxembourg City presents the event “Winterlights”, with several points of interest throughout the city; Place Guillaume II, Place de la Constitution and Place de Paris. If you enjoy Christmas markets, but you’re not in the mood to get out of the centre, this one is perfect for you. At this market you will find almost everything; many wooden stalls selling candles, toys, handmade decorations, sweets, the traditional hot wine (Glühwein) and even some traditional food (Mettwurst, the Luxembourgish sausages, or Gromperekichelcher, the potato pancakes). For the children, there is a magic carousel, a ferris wheel, a real Santa Claus booth to take a picture and even some kids activities at the ‘Chalet d’histoires’ (all at Place de la Constitution). Plus, if you want to spend some fun time with family or friends, you can head to the new ice-skating rink (Place Guillaume II, from 6th Dec to 1st Feb). For more information and detailed scheduling, click here . During the weekend of 29th and 30th November, the Vianden Castle also receives the magic of Christmas. The event is called “Weihnachtsmagie” and offers the visitors some 30 chalets representing local and international artisans. To add a special touch, a group of musicians will be singing around to the sound of Christmas carols. Another special Christmas market taking place in Luxembourg is the one in Dudelange. From 12th to 21st Dec, a medieval Christmas feeling will certainly add a little magic to the whole experience, by the Hôtel de Ville. Clervaux (7th Dec, from 10am). The Christmas market will take place in the city centre. Diekirch (20th and 21st Dec, from 11am to 6pm). The Christmas market will take Place in the Grand Rue. Differdange (12th to 23rd Dec). The Christmas market will take place in the city centre. Esch-sur-Alzette (22nd Nov to 23rd Dec, from 12am to 8pm). The medieval Christmas market will take place by the Hôtel de Ville and there will be a Saint Nicolas parade through the streets of Esch. Ettelbruck (12th to 14th Dec). The Christmas market will take place in the pedestrian area (Grand Rue). Haut-Martelange (5th to 7th Dec, Friday 7pm to 11pm, Saturday 3pm to 11pm and Sunday 11am to 6pm). In the area belonging to the Slate Museum (L-8823 Haut-Martelange) a Christmas environment will be set, full of traditional stalls and carols. Medernach (7th Dec, from 11am). The Christmas market (“Krëschtmaart na der Hal Medernach”) will take place at the sports center of Medernach. Remich (29th and 30th Nov, 6th and 7th Dec, 13th and 14th Dec, from 11am to 9pm). The Christmas market (“Weihnachtsmarkt”) will take place at Place Dr. F. Kons, in Remich. Wiltz (30th Nov from 3pm and 12th Dec from 5pm). Saint Nicolas Market will take place at the Place du Festival (30th Nov) and the Christmas Market will take place at the Castle. Christmas lights. Photo: Anje Kirsch. Strasbourg is known as the “Capital of Europe’s Christmas Markets”, a tradition dating back to 1670, when the capital of Alsace hosted its very first one. Make sure you taste the “bredeles” (little dried cookies), Christmas bread, cakes and decorations, “glühwein” (German mulled wine) and other handcrafts. Several Christmas markets can be found all over the city and the most important are Christkindelsmärik, in Place Broglie, Marché de Noël de la Cathédrale in place de la Cathedrale, Marché des Délices de Noël d’Alsace, in Place Austerlitz (the best one to taste some Alsace delicacies). Christmas in Strasbourg will wait for you from 28th Nov to 31st Dec. For more information, you should check the official website . Insider tip: Novotel Strasbourg Centre Halles offers an excellent location in the city centre, from where you can reach most of the Christmas markets within a few minutes walk. Also, do spend a little time to study the event schedule, as you might easily miss a visit to Santa or a special Christmas carol show. Colmar is a beautiful little village by the Vosges, and as such you will notice the colder temperatures of Alsace, the most German region of France. The cold contributes to the Christmas spirit and the fairytale ambiance; from the typical Alsatian houses, beautifully decorated, to the five Christmas markets spread all over Colmar. Children will be delighted to visit their very own Christmas market, by the Petit Venice area. They can even send a letter to Santa Claus (the organizers promise that all letters will be answered). From 21st Nov to 31st Dec, Christmas in Colmar waits for you. For more information, you should check the official website . Insider Tip: If you have children, make sure they bring a letter ready to be sent to Santa Claus, with your home address. For staying over for one or more nights, a true experience of Colmar can only be had by staying in one of the typical houses (you might want to search for something at www.abritel.fr). 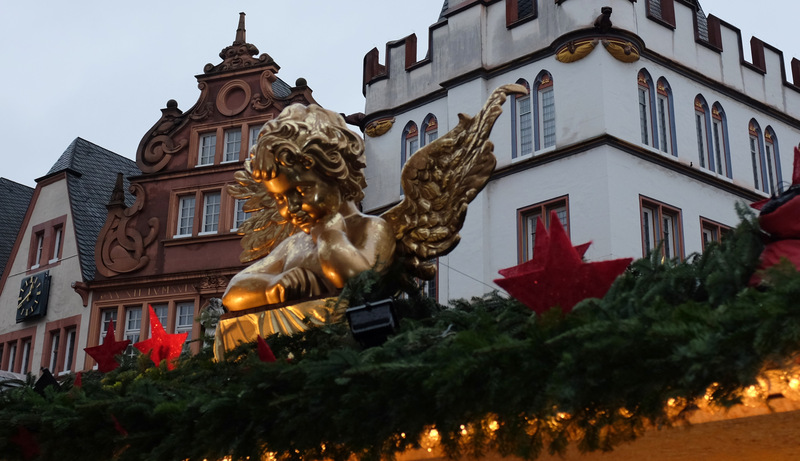 Just a few kilometres away from Luxembourg city, Trier offers you an excellent Christmas market. From 24th Nov to 22nd Dec, the oldest city in Germany presents more than 90 wooden chalets, concentrated especially in the old city centre square. The high quality of the handcrafts is something you will easily notice, but also the Glühwein and the traditional potatoes (“Reibekuchen”). For more information, click here . Insider tip: The earlier you get there, the better. Not only to arrive in the city, but also to park the car. Or even better, why not take a nice journey by Train? Bernkastel-Kues is a cosy little village just about an hour’s drive from Luxembourg City that, from 22nd Nov to 21st Dec literally wears the colours of Christmas. The pedestrian streets in the city centre make it perfect for strolling around the many traditional stalls. Each building is carefully decorated and there is even a life-sized Advent calendar (exact location shown in the print-friendly city map available from the official website). The Advent calendar will open a door with a musical surprise from 1st Dec to 23rd Dec, every day at 5:30pm, and on 24th Dec at 11am. Also, on the 6th Dec, around 5:30pm, head to the Mosel River bridge to find a good spot. By 6pm, the brave torch swimmers will pass by and St Nicholas in his boat will hand out gifts to the children by the riverbank. To get to know all details, click here . Insider tip: There are plenty of parking facilities by the river (on the old city side), but be sure to arrive early. Restaurant choices are quite limited, so you will want to book well in advance, if your plan includes a table somewhere. Hotel Zur Post offers an excellent location to visit the Christmas market and the public parking facilities are just in front of it. 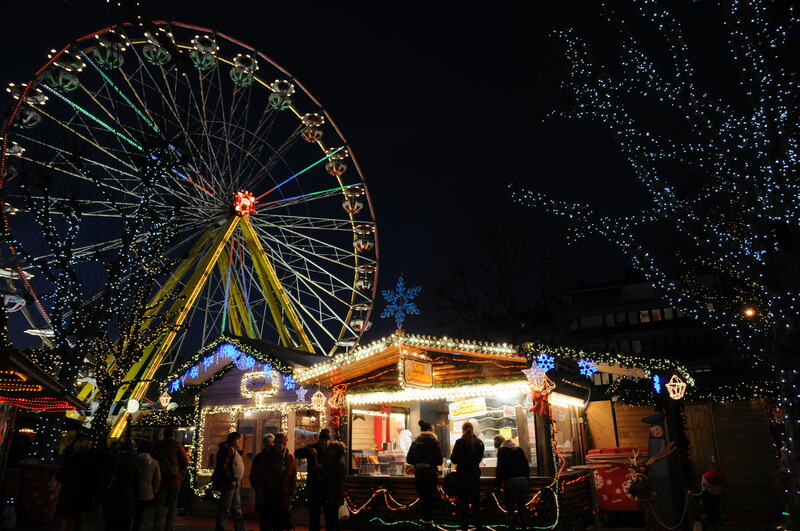 Cologne is a big city with a huge Christmas market, open from 24th Nov to 23rd Dec. The most well-known market (“Am Dom Market”) is located by the majestic cathedral, on the UNESCO World Heritage list. With the imposing Gothic backdrop and the largest Christmas tree in the Rhine, this market offers over 160 stalls selling the traditional Yuletide wares and their famous Glühwein (mulled wine). Traditional music fills the air, providing the perfect atmosphere for Christmas shopping. For children, the Alter Markt is the place to go, with a Santa’s grotto, puppet theatre and stands filled with toys. The Rudolfplatz will transport children both big and small to the world of the brothers Grimm, with fairytale figures and festive illuminations. For more information, you should check the official website . Insider tips: If you prefer a comfortable way to reach the various markets, the Christmas Market Express will be the right choice for you. The little train brings you to the four most beautiful Christmas markets in Cologne and departure times are daily every 15 minutes during Advent time. If you are an ice skating person, you should know that the largest mobile ice rink in Europe is located right there, at Heumarkt. Christmas in Trier. Photo: Unni Holtedahl. Brussels welcomes the event Winter Pleasures (“Plaisirs d’hiver”), from 28th Nov to 4th January. Grand Place and Place Ste Catherine are the main points and they are connected by the many attractions of the event. The big Ferris wheel and the ice skating rink are the big stars. For more information and a print-friendly map, please visit the official website . Insider tips: Novotel Brussels off Grand Place and Best Western Carrefour de l’Europe are very well located. If you want to avoid traffic problems and parking nightmares, taking the train is for sure your best bet. Bruges is the perfect city for the perfect Christmas post card, with the old houses by the canals and the handcrafted sweets. From 21st Nov to 4th Jan, the Grote Markt is home to the main Christmas market and the big ice skating rink is a major plus. For more information on the Christmas Market, please visit the official website . Also during the same dates, there will be a Snow & Ice Sculpture Festival, located on the Station Square, directly in front of the main station building. Just follow the signs for ‘Snow & Ice’ until you reach the large parking area where the festival is being held. Plus, the city centre of Bruges is within easy walking distance. More information on the Ice Festival here . Insider tips: To experience the real magic of Bruges, you must stay in one of the traditional houses by the canals (you can try your luck here – www.airbnb.com). If you need to add some Disney magic for your children’s happiness, plan to drive a little more and reach Antwerp, where you can visit the Disneyland Paris Ice Dreams . Enjoy and have a merry Christmas market time! Christmas Markets 2 / Mercados navideños 2 / Marchés de Noël 2.